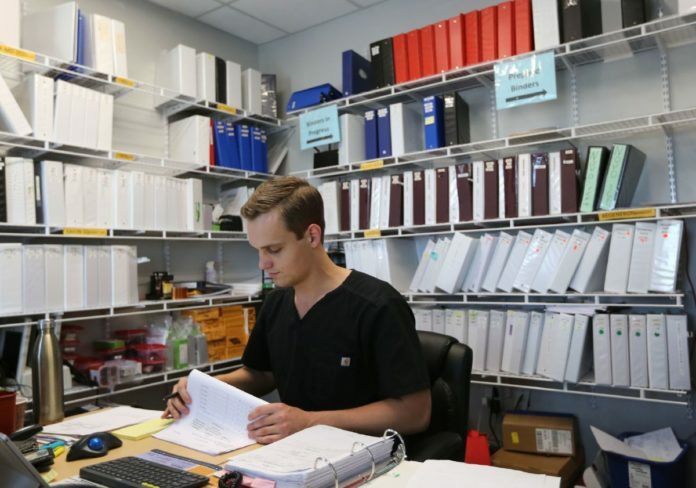 Max Kepcha goes through paperwork for a drug trial as binders of medical information sit on shelving Thursday, April 26, 2018, at Consano Clinical Research in San Antonio. SHAVANO PARK — Walking into this unassuming doctor’s office here in the small, wealthy enclave within San Antonio is not unlike what one could do in McAllen. There’s a roughly 30-chair waiting room with one bathroom, a water fountain, some hanging art and a desk attendant. But there’s one distinct difference between this doctor’s office and many in the Rio Grande Valley: This one has a small, yet robust research wing. Consano Clinical Research conducts phase one through four research, studying diabetes and metabolic systems, among other specific areas. This research group has a section of the doctor’s office all to itself where it performs studies. The research team, run by Greg Consano, reports to Dr. Michelle Welch, a full-time physician who runs the entire building. Clinical research in the Valley is in the embryonic stage, especially compared to San Antonio. There are doctors who do research, but it’s not an expansive community, according to many in the medical field. With the University of Texas Rio Grande Valley School of Medicine being just two years old, city of McAllen and university leaders are hoping that the research community grows. McAllen city commissioners voted in February to give $1 million toward a cancer immunology program at the university’s research facility, which is set to open locally this year. “Having a school of medicine will cultivate interest in research,” said Sofia Hernandez, chief of staff at the medical school who formerly worked at Doctors Hospital at Renaissance. One of the three core missions for the School of Medicine is research, Hernandez added. McAllen Mayor Jim Darling said having the medical school will eventually filter into the community as classes of students graduate and open their own practices. That pioneering isn’t easy, Consano noted. But having a physician committed and prepared to include a research component to his or her practice is key. Consano Clinical Research is not even 10 years old. Consano fell into research, which is how many get into the field, he and other San Antonio-based researchers have said. Before working at Amazon, he was at the U.S. Department of Defense working with nuclear weapons and missile safety. He was looking for work when a neighbor working in medical research connected him with Welch. Technically, Consano Clinical Research is a Site Management Organization, or SMO, which is an entity that manages the studies for physicians or work to get studies for the physicians, and they train the staff on how to do it. An SMO gets studies through contracts with Contract Research Organizations (CRO), Consano said. CROs are linked to pharmaceutical, biotechnical or medical device companies that contract with a CRO to find studies. A CRO will then contract with an SMO, such as Consano Clinical Research, to perform the studies. SMOs often work with various physicians, but Consano is solely dedicated to Welch. In Consano’s case, since he reports to Welch, she signs a contract that has oversight from the Food and Drug Administration that Welch is going to conduct studies in accordance with a number of rules and regulations. And Consano conducts all the studies. Because of all the guidelines, there are some essential skills required when working in research, Consano said, such as organization and precision. The medical industry — the research side included — is highly regulated, so Consano said he and his small team need to be error-free in their work. His employees tend to be current or soon-to-be medical students, who he needs to trust. Often, the employees are passionate about the work, he said, so it makes the job enjoyable for them. Max Klepcha, 24, took a gap year after earning his undergraduate degree before going to medical school to get hands-on experience. With a budding school of medicine and a hope of more physicians dipping into research, there is an opportunity for students, medical or not, to provide an employment base for conducting clinical trials, and to possibly create new avenues in the industry they may not have otherwise realized.